How far could you go? After a plane crash in a remote Canadian wilderness, elite endurance runner Dan Collins laces up his trail shoes and faces the race of his life - to save his wife, his daughter, and himself. The James Bay Region of far northern Quebec is one of the most isolated locations on Earth. Dan, his wife Deb, and their young daughter survive the crash, but Deb's leg is broken, and no one is looking for them - or even knows they're missing. Dan may be better trained athletically than anyone alive to cover hundreds of miles of broken ground on foot. His training as a health professional, though, gives him unique insight to the agonizing deterioration of his body and mind as his journey unfolds, and his analytical mind finds constant metaphor in his continuing metabolic breakdown. His physical progress is paralleled with a careful and tender examination of Dan's and Deb's ambivalent marriage, and the tension between them as ambitious elite athletes in the very different worlds of the road marathon and the trail ultra. Runners of any distance will find a uniquely deep consideration of these two sometimes opposing aspects of the sport - the fame of fabled road races vs. the allure of the lonely rugged trail - and every listener will relate to themes of ambition, guilt, identity, and loss as they play out for one character in the race of his life. Running Out does for ultrarunning what Once a Runner did for the track mile, and listeners who enjoy nonfiction about running like Born to Run will be engrossed in a survival narrative thriller set against the backdrop of endurance running and extreme sports. Of the great plot lines, Running Out has Man versus Nature, Man versus Himself, perhaps Man versus Machine if you want to be technical about it. I pride myself on predicting lines and endings of TV shows and movies—which makes me really irritating to watch Netflix with—but I couldn’t predict what would happen next in Running Out. 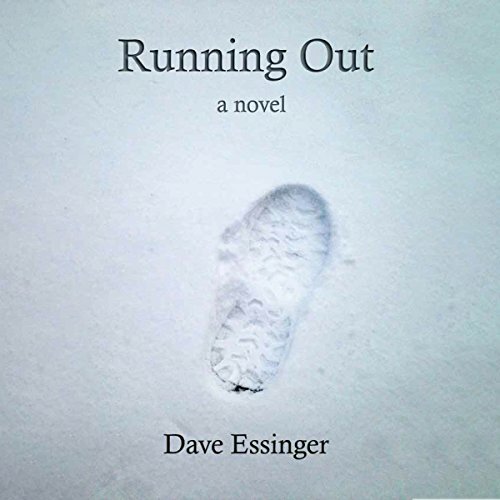 Essinger has created unique and fleshed-out characters, set in a bleak and barren environment. I have a friend who does ultra-marathons, so I was vaguely familiar with the sport before reading this book. The idea that humans are capable of such feats—moreover, humans I actually know—is amazing. The non-linear form of the narrative made it interesting and kept me curious. The time jumps felt natural— I could easily see a runner lost in memory while running for hours on end. It’s not just a survivalist story, it’s also the story of being a father, a husband, and a son. And I learned things. The addition of the science was fascinating to me, and Essinger blended it into the narrative seamlessly. This is a great book for any endurance runners, or former runners, or maybe one day in the future runners. I went into the book knowing very little about running and still enjoyed the vicarious experience immensely.